From 2005 to 2013, the number of owner-occupied detached single-family homes has declined by more than 1 million. Meanwhile, the number of renter-occupied single-family homes rose by 2 million. Fannie Mae says the rise in renter-occupied single-family homes was a short-term solution to the burst of the housing bubble, but it has taken away open inventory for first-time buyers. The lack of starter home inventory for first-time homebuyers has been documented over the past couple of years, with agents and brokers in all markets reporting that the pickings for entry-level buyers remains woefully slim even years after the Great Recession. 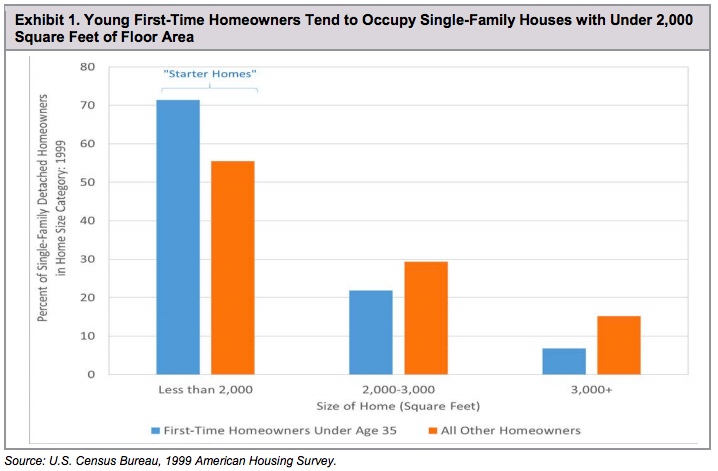 Where’d all the starter homes go? They’re rentals. A new “Housing Insights” report from Fannie Mae offers a potential explanation: Starter home inventory has shifted from owner-occupancy to rentals. Fannie Mae reports that “the stock of owner-occupied starter homes declined by more than 1 million units between 2005 (roughly the peak of the housing boom) and 2013 (the most recent year for which data are available), whereas the inventory of renter-occupied starter homes rose by approximately 2 million units during this period. Starter homes are homes that are less than 2,000 square feet and are occupied by first-time owner-occupants under the age of 35. This definition is based on pre-bubble housing data that showed 71 percent of detached single-family homes occupied by young first-time homeowners were less than 2,000 square feet — compared to 55 percent of homes occupied by other homeowners. According to Fannie Mae, the housing bubble and subsequent bust led to a huge demand for single-family rental housing. Between 2005 and 2013, the number of renter-occupied detached single-family homes increased by approximately 3 million, which accounted for more than half of the total growth in renter-occupied stock. Meanwhile, the number of owner-occupied starter homes fell by more than 1 million during that same 8-year period. “The shift of the starter home inventory from owner-occupancy to rentals reflects, at least in part, a much-needed market adjustment in response to imbalances created by the credit bubble and homeownership boom of the early 2000s,” said director of strategic planning Patrick Simmons in a statement. But, as he later notes, the short-term solution has become a long-term problem for today’s would-be homebuyers, who are already battling the woes of low inventory, due in part to the high number of single-family homes that are being used as rentals. The large # of single-family homes that are being used as rentals are adding to first-time homebuyer inventory woes. Furthermore, as seen in recent reports by the National Association of Realtors and the California Association of Realtors, the low inventory problem is being exacerbated by the lack of new single-family homes being built. Over the past 10 years, the construction number of single-family homes (detached and attached) has dropped by 8 percentage points to 32 percent in 2015. Furthermore, by 2011, the number of starter-home completions dove to less than 200,000 units per year. The report reveals that people are building houses again, but they’re for homeowners who are seeking move-up homes with more than 2,000 square feet in space. Fannie Mae says its findings don’t bode well for first-time buyers, who are already between between a rock and a hard place when it comes to homeownership. Tight starter home supply + rapid price gains are reducing affordability. “In turn, the tight starter home supply and associated rapid price gains in the lower tiers of the home sales market are reducing first-time home buyer affordability,” says Simmons.